CritiqueBrainz is in Beta! | goFLOSS! You might have heard of MusicBrainz, the open music database? It’s a bit of a nerdy Discogs, with more details and a better structure. It is run by the MetaBrainz non-profit organisation, and the data is of course gathered by more than 250,000 contributors, similarly to Wikipedia or OpenStreetMap. This project has been around for a while (it started in 2002), and a thing that I love about it is that it keeps on getting better with very regular updates. It also adds elements to the database scheme, which makes it potentially more precise, while getting more user friendly too by enhancing the user interface. Overall, this gives me a warm feeling of sustainability in the project. At the moment of writing, the database includes more than 840,000 artists, 1.2 million releases, 13.4 million recordings and 81,000 labels. One thing that was missing in the project, even though users could give a five-star rating to entities, was the capacity to write actual creative release reviews – which makes sense as the database aims at gathering verifiable objective data about music, not user opinions about it. It is now possible with the launch of the CritiqueBrainz beta, as separate website that gathers reviews under a Creative Commons (CC) license. To kick-start the new MusicBrainz family member, a big import of nearly 9000 BBC reviews under CC license has been made. One cool thing is that the reviews integrate a little Spotify player that lets you listen to the album while reading someone’s rants/praise (if (1) you have a Spotify account and (2) the release in question – or, better said in the database jargon, “release group” – has been matched with a Spotify release in the MusicBrainz database). 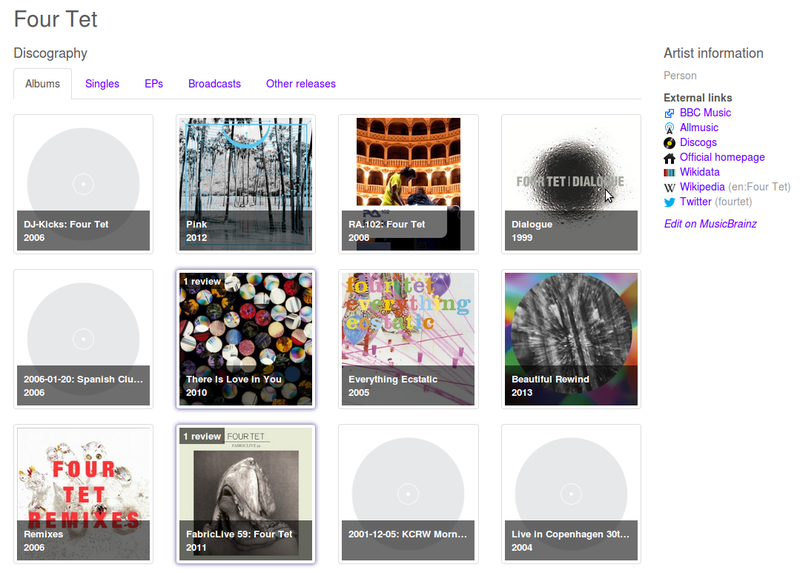 Even if a release group has not been reviewed yet, you can still browse the MusicBrainz database through the CritiqueBrainz website, and it looks a lot more like what the lambda user expects of a discography website – which also makes it very practical for example for finding out which cover arts are missing from the database. The look of an artist page on CritiqueBrainz – less cryptic than its big brother. One thing I have noticed is that for the moment, the reviewers are not able to give ratings to the releases. As I mentioned earlier, it is possible in MusicBrainz to rate most elements out of five stars (artists, releases, recordings, works, labels…), but the reviewers on CritiqueBrainz seem to only communicate their views through the written comments. It could be a way to promote a more elaborate explanation of the contributor’s judgement, which is fair enough I guess. But this brand new website also has the potential to attract original reviews and congregate a number of reviews already available on the Internet under a CC license, which would ultimately be a great way to add this kind of relevant data to the database itself. Readers can however thumb up or thumb down the reviews, which will likely reveal the most interesting, convincing and well-written ones to the top after a big enough user base has joined the project. Example of a review on CritiqueBrainz. This one, on the latest Knife album, was imported from the BBC reviews. This website was made possible thanks to the work of two Google Summer of Code students: Maciej Czerwiński for the year 2013, and Roman Tsukanov for the year 2014. Thank you guys for that great work! You can read the whole announcement on the MusicBrainz blog by following this link. And if you want to participate in this website’s development, the code is on GitHub. Edit: the issue about rating releases has been reported on the bug tracker already, and Roman stated that the enhancement is on the roadmap. ← Wikipédia en Français atteint 1,5 million d’articles !